Findings In this cohort study of 241 younger siblings of children with autism, the prevalence of autism spectrum disorder was 14.1% in children whose mothers took prenatal vitamins in the first month of pregnancy compared with 32.7% in children whose mothers did not take prenatal vitamins during that time. 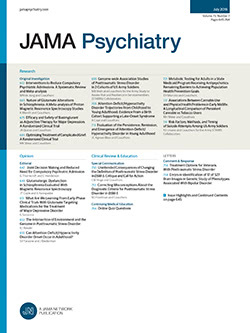 Meaning Maternal daily intake of prenatal vitamins during the first month of pregnancy appears to be associated with reductions in recurrence of autism in high-risk families; additional research is needed to confirm these results, to further investigate specific nutrients, and to inform public health recommendations for autism spectrum disorder prevention. Importance Maternal use of folic acid supplements has been inconsistently associated with reduced risk for autism spectrum disorder (ASD) in the child. No study to date has examined this association in the context of ASD recurrence in high-risk families. Objective To examine the association between maternal prenatal vitamin use and ASD recurrence risk in younger siblings of children with ASD. Design, Setting, and Participants This prospective cohort study analyzed data from a sample of children (n = 332) and their mothers (n = 305) enrolled in the MARBLES (Markers of Autism Risk in Babies: Learning Early Signs) study. Participants in the MARBLES study were recruited at the MIND Institute of the University of California, Davis and were primarily from families receiving services for children with ASD in the California Department of Developmental Services. In this sample, the younger siblings at high risk for ASD were born between December 1, 2006, and June 30, 2015, and completed a final clinical assessment within 6 months of their third birthday. Prenatal vitamin use during pregnancy was reported by mothers during telephone interviews. Data analysis for this study was conducted from January 1, 2017, to December 3, 2018. Main Outcomes and Measures Autism spectrum disorder, other nontypical development (non-TD), and typical development (TD) were algorithmically defined according to Autism Diagnostic Observation Schedule and Mullen Scales of Early Learning subscale scores. Results After exclusions, the final sample comprised 241 younger siblings, of which 140 (58.1%) were male and 101 (41.9%) were female, with a mean (SD) age of 36.5 (1.6) months. Most mothers (231 [95.9%]) reported taking prenatal vitamins during pregnancy, but only 87 mothers (36.1%) met the recommendations to take prenatal vitamins in the 6 months before pregnancy. The prevalence of ASD was 14.1% (18) in children whose mothers took prenatal vitamins in the first month of pregnancy compared with 32.7% (37) in children whose mothers did not take prenatal vitamins during that time. Children whose mothers reported taking prenatal vitamins during the first month of pregnancy were less likely to receive an ASD diagnosis (adjusted relative risk [RR], 0.50; 95% CI, 0.30-0.81) but not a non-TD 36-month outcome (adjusted RR, 1.14; 95% CI, 0.75-1.75) compared with children whose mothers reported not taking prenatal vitamins. Children in the former maternal prenatal vitamin group also had statistically significantly lower autism symptom severity (adjusted estimated difference, –0.60; 95% CI, –0.97 to –0.23) and higher cognitive scores (adjusted estimated difference, 7.1; 95% CI, 1.2-13.1). Conclusions and Relevance Maternal prenatal vitamin intake during the first month of pregnancy may reduce ASD recurrence in siblings of children with ASD in high-risk families. Additional research is needed to confirm these results; to investigate dose thresholds, contributing nutrients, and biologic mechanisms of prenatal vitamins; and to inform public health recommendations for ASD prevention in affected families.